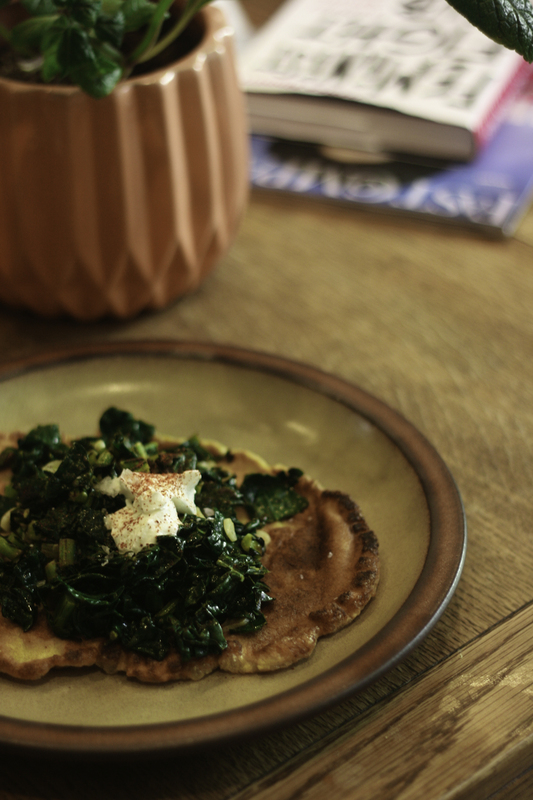 Socca is an eggy, savory chickpea pancake from Southern France. In many ways, it’s the southern version of a crepe, and in many ways, it’s way way better. I discovered socca in Nice, on a cloudy day at the Flower Market during my study aboard spring break. I was wandering aimlessly, awe struck by the colors, the language and the abundance of fresh produce, when I noticed a frenzied crowed. They were hovered around a massive cast-iron skillet, from which a voluptuous woman was doling out slices of a golden pancake, the likes of which were no smaller than four feet in diameter. The socca was rich, nourishing, subtly savory and clearly a labor of love and routine. I dream about it often, as it marked the true beginning of my locavore-style travel tendencies. That meal was a full sensory experience. The sounds of the sizzling pancake and the muffled French conversations, the sharp early Spring chill in the air and the smell of toasted oil and nutty chickpeas radiating from the skillet were all seared into my memory at first bite. At a time in my life that was moving so so fast, when I was incredibly naïve and surrounded by unfamiliarity, it’s these hyper-sensory moments in time that remind me where I’ve been and inspire me to keep exploring. I’ve since learned that socca is almost too easy (and cheap!) to make. Re-hydrate some chickpea flour with water, add spices and egg and cook it mega-pancake style in a well-oiled cast iron skillet. Top with sautéed vegetables and eat for breakfast, lunch or dinner! This recipe calls for Indian spices, because I like how the bold aromatic flavors partner with the savory and nutty chickpea flavor. Truth is, the flour isn’t that intrusive, so you can and should play around with what you mix in. Sqirl, for example, throws vegetables into the batter instead of on top. I’d also love to try out fresh herbs like basil and thyme or dried herbs de provence. You can make one big pancake – niçoise-style, or try smaller fritters for a more traditional pancake serving style. There are really, seriously, no rules here. Go with what sounds good today and you'll be golden as a socca in the sunshine! Heat some oil in a cast iron or non-stick skillet. Sautee greens and garlic with a little salt for about 5 minutes. Turn heat up higher for crispier kale! Remove vegetables and set aside. Add eggs and spices to rehydrated chickpea flour and beat until texture in uniform. Add a nice coating of oil to the skillet and heat until shimmering. For a large pancake, pour batter in to coat entire skillet. For smaller pancakes, give enough space between them so they can spread out. Cook over medium high heat for 3 minutes, checking that the bottom is nice and golden before flipping. Cook on the other side until pancake feels firm and batter is cooked through. Remove from pan, top with vegetables, and enjoy!